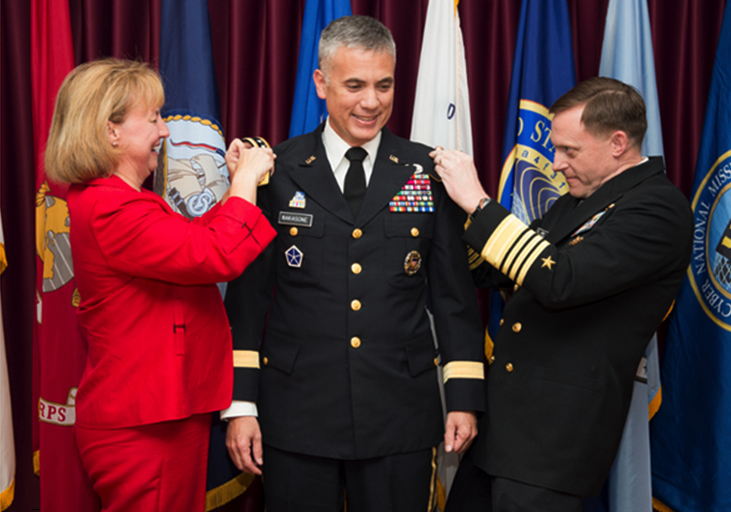 Susan Nakasone and Adm. Michael Rogers pinning the second star on Maj. Gen. Paul Nakasone. FORT MEADE, Md. — U.S. Army Brig. Gen. Paul M. Nakasone received a frocked promotion to major general in a ceremony that packed an auditorium at the headquarters of the National Security Agency on April 29. He was sworn in by Lt. Gen. Edward Cardon, commander of the U.S. Army Cyber Command, where Nakasone was previously assigned. The Nakasone family was well represented. His parents, Col. (U.S. Army, retired) and Mrs. Edwin Nakasone, his wife Susan, his four children, and a cousin were all in attendance. Edwin Nakasone was a member of the Military Intelligence Service during World War and is originally from Hawaii. The number of flag and general officers in the audience would have lit up the sky over Fort Meade, which is a great testament for the respect that Paul Nakasone has earned with all of the military services. Retired general officers at the ceremony included Gen. Keith Alexander, former director of the National Security Agency, and Lt. Gen. Eric Schoomaker, former Army surgeon general. The Japanese American Veterans Association was represented by board members Rodney Azama and Wade Ishimoto. Adm. Michael S. Rogers, who is triple-hatted as commander, U.S. Cyber Command; director, National Security Agency; and chief, Central Security, provided remarks during the ceremony. He spoke for over 10 minutes without notes, thereby showing his true knowledge of Nakasone and his accomplishments. Rogers talked of Nakasone receiving his commission through the Reserve Officers Training Corps at Saint John’s University in Minnesota, his service in Iraq and Afghanistan, and how he was a key member of those who stood up the U.S. Cyber Command a few years ago. The admiral also paid tribute to Nakasone’s family and their sacrifices during his career as well as to those who have served with him.